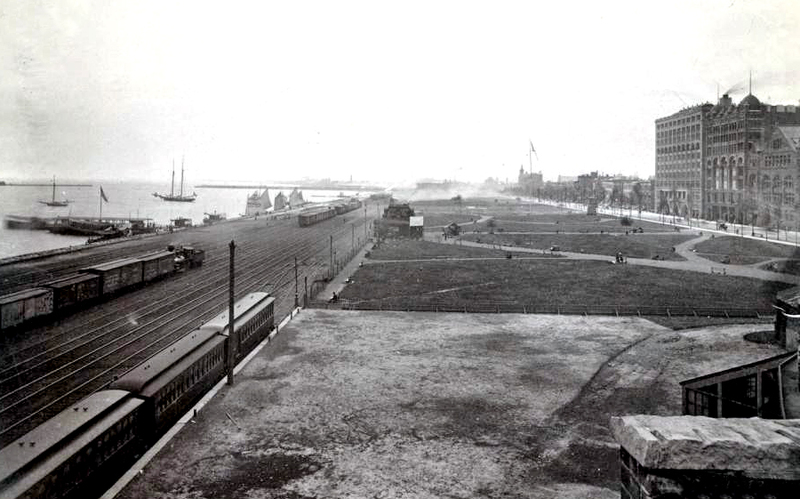 January 14, 1898 – Another chapter in the continuing story of Aron Montgomery Ward and the area we today know as Grant Park unfolds as Ward reacts strongly to a plan that would see a great exposition hall built in the park, a project that would receive city abatement of ground fees, taxes and assessments. Ward minces no words, saying, “To erect a large building [in the park] would be doing an injustice to those who have spent millions in erecting fine buildings and halls throughout the city … They have paid their fair and full proportion of taxes and assessments for years, and their investments in assembly halls have not paid them 2 per cent. Now they can see their way, with the increased population and the evident return of prosperity to the country, to make simply the interest on their investments … Why should this great octopus be given land with no ground rent to pay and free from taxes and assessment? … It is one of the biggest schemes ever sprung on the citizens and taxpayers of Chicago. All others pale before it.” [Chicago Daily Tribune, January 15, 1898] One day maybe someone will gather the funds to erect a statue to Ward in the park on the lakefront. In his continuing battle to protect the property, he did more than anyone else to keep it open, clear and free so that we might enjoy its many benefits today. The area under consideration for the new exposition hall is pictured above. Also on this date from an earlier blog . . .
January 14, 1927 -- The report of George M. Wisner's testimony before Charles Evans Hughes, special mater of the United States Supreme Court, is printed. Eisner, the consulting engineer for the Chicago sanitary district, attempted to answer the demands of Wisconsin and five other Great Lakes states seeking an injunction that stopped water diversion from Lake Michigan into the Chicago River. Eisner recounted what life in Chicago was like before the river was flushed with lake water. He said, "The Chicago river was a pest hole of typhoid and intestinal disease germs . . . It was a big septic tank festering on the bottom and sending upwards dangerous poisonous gases. The crust of filth sometimes became so thick that a chicken could walk across the river. At other times the crust caught fire." To avoid a return to those days, Wisner asserted that a maximum of 10,000 cubic feet of lake water per second was needed to cleanse the river. 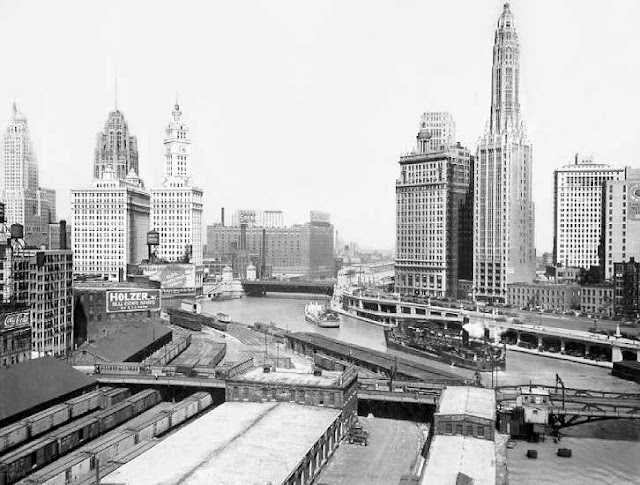 Chicago lost the battle when the Supreme Court decreed on April 21, 1930 that the diversion of lake water be gradually reduced to a 1,500 cubic feet per second rate by December 31, 1938. The photo above pictures the river as it looked about the time Wisner offered his testimony.